Anna Mangen drives for a layup after coming up with a second half steal against Eaton. Jenna Hoschouer drives inside as Bailee Worley defends. Salena Roberts drives into the lane as Annika Gels moves up to defend. 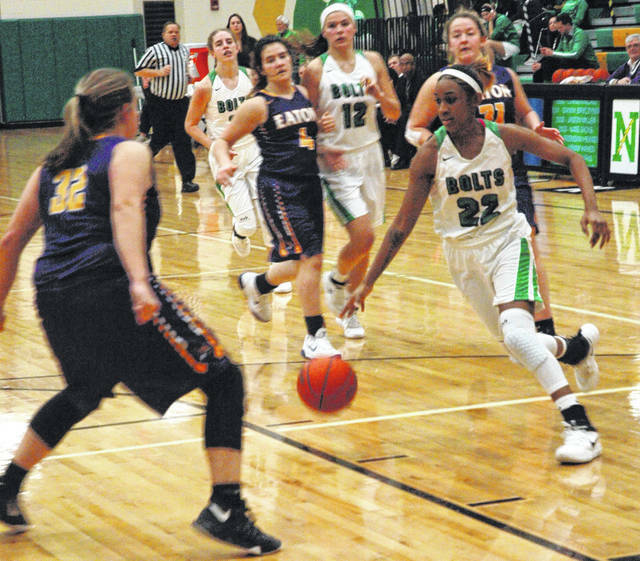 CLAYTON — The Northmont girls varsity basketball team Monday hosted non-conference opponent Eaton of the Southwester Buckeye League for Senior Night and cruised to a relatively easy 30 point win. Five of the six seniors managed to score during the victory led by Anna Mangen and Salena Roberts with 11 points each. When Mangen graduates it will mark the end of an era at Northmont. The Lady Bolts stumbled out of the gate in the first quarter. Both teams had trouble finding the hoop early on. Northmont led 6-2 at the end of the first quarter before going on a 6-0 run to open the second quarter followed by an 8-0 run to take a 20-4 lead en route to a 25-13 advantage at halftime. 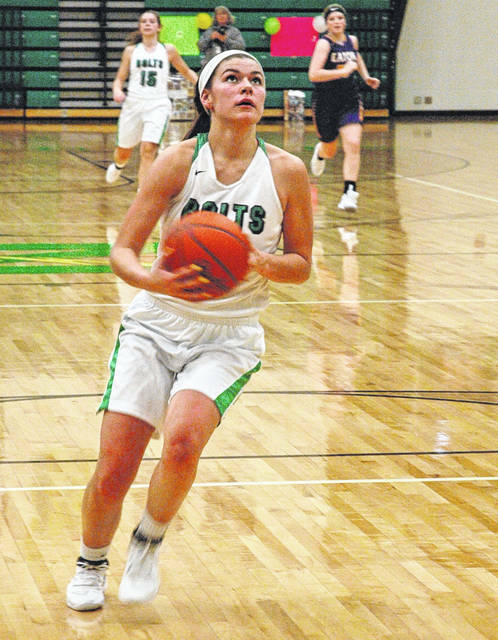 Northmont out-scored Eaton 23-10 in the third quarter on its way to posting a 59-29 victory. The Lady Bolts close out regular season play with games at Trotwood-Madison on Thursday and at Miamisburg on Saturday. Both games are set for 7:30 p.m.
Northmont opens sectional tournament play on Saturday, Feb. 17 against Tecumseh at 1 p.m. at Troy High School. Freshman guard Kylee Pitsinger led the Lady Eagles with 8 points. Eaton is in the process of building its program back up. 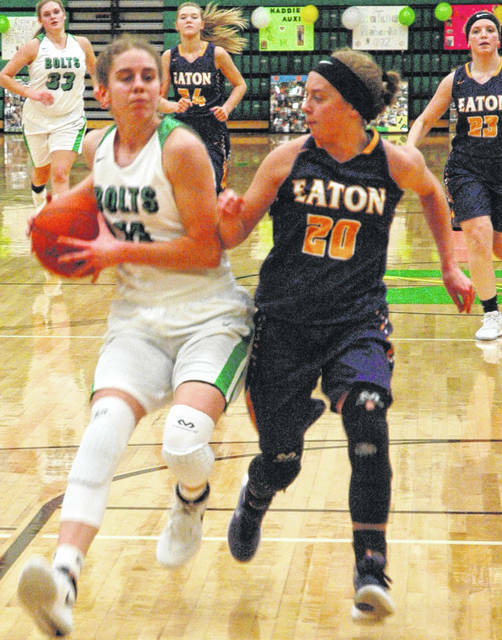 Eaton closes out its regular season at Bellbrook on Thursday (7:30 p.m.) and at National Trail on Saturday (7 p.m.) The Lady Eagles open sectional tournament play against Springfield Shawnee on Saturday, Feb. 17 at Tecumseh High School. Eaton: Emily Dungan 2-2-6, Bailee Worley 1-0-3, Ashley Earley 0-1-1, Bailey Shepherd 2-2-4, Becca Mowen 0-3-3, Annika Gels 1-0-2, Kylee Pitsinger 2-3-8. Totals: 8-11-29. Northmont: Makala Cooper 2-2-7, Jenna Hoschouer 3-1-7, Anna Mangen 4-0-11, Madelyn Auxier 1-0-2, Salena Roberts 5-0-11, Camryn Nadir 3-2-8, Shalaya Heath 3-2-8, Gabby Kline 1-1-3, Taylor Garrison 1-0-2. Totals: 23-8-59. 3-point goals: Eaton 1 (Worley); Northmont 5 (Mangen 3, Cooper, Roberts). Records: Eaton 6-14, Northmont 10-9.